These cleaning tools might not make cleaning any more fun, but they'll definitely make it easier! It’s said that a workman is only as good as his tools, and to a certain extent I agree. Skill can only take you so far, and applying the same skill with better tools will almost always give you a better result. I find that is especially true when it comes to cleaning! You can still get your house clean using subpar cleaning tools, but having a few great cleaning tools can make all the difference! I do a lot of my household shopping on Amazon, including buying cleaning tools when I need them. When I’m searching for cleaning tools, I always consult the customer reviews before buying. In most cases, the customer reviews will reveal whether or not the tool does what it claims to do on the product page, and whether it was worth the money they paid for it. Today I’ll be putting my Amazon searches to good use by sharing a list of some of the most highly rated cleaning tools I could find. I also asked for cleaning tool recommendations from my Facebook followers, and factored those recommendations into my list. (You can find me on Facebook here!) My ultimate goal was to feature a variety of different tools a different price points, so that hopefully there’s something here for everyone. :-) Any one of these tools is sure to help you get your cleaning done in no time! This chainmail scrubber might look like it belongs at a renaissance fair rather than in your kitchen, but it’s actually a great tool for anyone who uses cast iron pans! This rust-resistant stainless steel scrubber is gentle enough that it won’t scratch your pans, but tough enough to scrub away crusty messes. Use it to clean cast iron pans, pizza stones, stainless steel pans, and more! Find it on Amazon here. These happy-faced scrubbers have quite the cult following online. People who love the Scrub Daddy seem to REALLY love it! And it’s no wonder, because this sponge is versatile, easy to use, and can fit into small nooks and crannies for a thorough clean. You can also influence the stiffness of the sponge by using warmer or cooler water as you wash. Hot water makes the sponge very pliable, while cold water makes it stiffer and better for scrubbing tough messes. Find it on Amazon here. This brand of laundry soda seems to be one of the more popular ones you can find on Amazon. 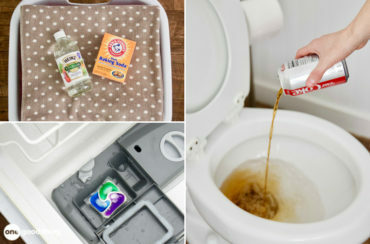 Reviewers say this laundry soda leaves their clothes clean and soft to the touch, without any added scents or colors. If you’re looking to switch to a more natural laundry detergent, give this one a try! Find it on Amazon here. It might seem like $40 for a mop is a bit much, but it also comes with 3 reusable mop pads and 2 microfiber cleaning cloths. That’s not a bad deal, all things considered! But the main selling point of this mop seems to be its size. This mop is 18″ wide, which means you’ll need fewer passes to mop your floors. You’ll be done with your mopping in a flash, and when you’re done, just toss the mop pad in with your laundry to clean it! Find it on Amazon here. Most of us already know that microfiber cleaning cloths are one of the best cleaning tools you can buy for the money. You can use them on almost any surface, and they trap dust and dirt really well. One thing that sets these cloths apart from others on the market is their size. These measure about 16″ x 16″, so you have plenty of surface area to work with. They also come in different colors! Find it on Amazon here. While microfiber pad mops are very popular right now, many people still prefer to use a good old fashioned mop-and-bucket system. If that sounds like you, consider this highly-rated option. The bucket has a nifty spinner system that you operate with a pedal, so you can squeeze out as much or as little water as you like. Find it on Amazon here. These cleaning brushes are prefect for all my fellow, ah… “cleaning enthusiasts” out there. :-) You can use these small angled brushes to get into all the nooks and crannies in your bathroom that are typically hard to reach. Your faucets, drains, and fixtures have never been so clean! Find it on Amazon here. Reviewers on Amazon swear by this foaming cleaner for garbage disposals. It’s supposed to be great and cleaning and deodorizing your garbage disposal in one, which could definitely save you some time on your kitchen cleaning. Check out the reviews on Amazon for first-hand accounts of this foaming cleaner eliminating all kinds of weird disposal smells. Find it on Amazon here. In my opinion, there’s clean… and then there’s Magic Eraser clean. These magical sponges are often the only thing that can really take care of scuffs, grime, and stains around the house. The Magic Eraser Bath Scrubber comes with a cleaning solution pre-loaded in to the sponge, so it’s the perfect tool for tough tub and tile jobs. You might not even know how clean your tub can get until you try using one of these! Find it on Amazon here. Cleaning tubs and showers can be a pretty physically demanding job. All that reaching, bending, and kneeling can leave you feeling beat up! But an extendable scrubber like this one from OXO can make the job a lot more comfortable! Just extend the scrubber to the length you need, and easily scrub away all that grime and soap scum. Find it on Amazon here. This hand duster has a couple of different things going for it that elevate it above your standard feather duster. First, it’s longer than the average duster, which gives you more surface area to clean with. And second, this one has a reusable microfiber dusting head that’s machine washable. The fluffy microfiber traps dust and dirt, and you can just toss it in the wash to clean it when you’re finished dusting. Simple! Find it on Amazon here. People really seem to like this stainless steel cleaning spray. It’s got coconut oil and lavender essential oil in it, which are both ingredients you can feel good about using in your kitchen. If you own a lot of stainless steel appliances, a spray like this could make your cleaning routine a lot quicker and easier! Find it on Amazon here. I have heard a lot about the Nellie’s laundry soda. It is gentle on the clothes and doesn’t discolor them and also cleans them in a jiffy. I just wanted to ask you if it can be used to clean carpet stains? There are so many carpet cleaning products in the market but they contain harmful chemicals and cannot guarantee a clean carpet without damaging the fibers. This laundry soda is natural but I don’t know if it can clean the carpet. I ordered the OXO Microfiber Hand Duster. It was awful, shedding fibers all over the place. I am disappointed that you would recommend it without mentioning this fairly significant issue. Sorry Elaine! It sounds like you may have received a defective dusters – I don’t see any other complaints about that issue in the reviews. I would try contacting Amazon! Planet laundry detergent is much cheaper. It is basically minerals and nothing else. Only 1 Tablespoon per load, so a box lasts me months. Costs less than $10 per box. I LOVE, LOVE, LOVE my O-Cedar ProMist Microfiber Spray Mop!! I have about four of the mop cloths that go on it, and it cleans VERY well. I especially love that I can use my own solution, and unlike the other popular same-type mop, I am not always hitting that silly button and spraying cleaning solution where it doesn’t need to go! The grab-it-and-squeeze spray handle is much easier and less accidental-spray prone. Just toss the dirty mop cloth in the washer with your dirty towels, or a different load, and you’re good to go again! I agree 100%. Even using vinegar and water is not good for pets. Thank you for posting this comment. Thank you for this great list. I’m a clean freak and now I have some more clean freak tools to use! I made the mistake of putting an old rotting smelly onion in my disposal and the smell still lingers months later. I hope the Disposer Care cleaners will get rid of that horrible odor. The O’Cedar easy wring mop and bucket are the greatest! Makes mopping almost fun! I have been thinking about buying the spin mop. Thanks for the round-ups.